After last month’s grueling globe-trotting adventure, I was relieved to find out that the ingredients for this challenge were all within range of public transportation or bicycle. The Mock Turtle sighed deeply, and drew the back of one flapper across his eyes. He looked at Alice and tried to speak, but, for a minute or two, sobs choked his voice. "and perhaps you were never even introduced to a lobster—"
And delightful they are. However, unlike the Mock Tortoise, we don’t dance with our lobsters, we eat them. Just across the street from Wonderland (the last ‘T’ stop on the Blue line) is Revere Beach, where you can look out over Massachusetts Bay and see the lobster boats hauling their catch back to the docks. We bought three frisky crustaceans at a nearby fish market. From Wonderland, we headed to nearby Chelsea, where good things were growing at Mario Cutone’s place. Joni obviously wasn’t referring to a morning at the Cutone Mushroom ranch where they keep them all in the dark and feed them shitake-chow. Nevertheless, the Portobellos and shitakes there grow plump and flavorful. It’s too early in the year for homegrown tomatoes in these parts, but at Volante Farms in Needham, they get a head-start on the season with their high-tech greenhouses. We found fresh tomatoes and scallions there. And some farm fresh eggs next door at Owens Poultry farm. Next, we went in search of cheese. MOUSEBENDER: In a nutshell. And I thought to myself, 'a little fermented curd will do the trick'. So I curtailed my Walpoling activities, sallied forth, and infiltrated your place of purveyance to negotiate the vending of some cheesy comestibles. At Russo’s Farmstand in Watertown (where they actually do sell cheese) we found fresh Mozzarella and Ricotta made in Quincy from local milk. 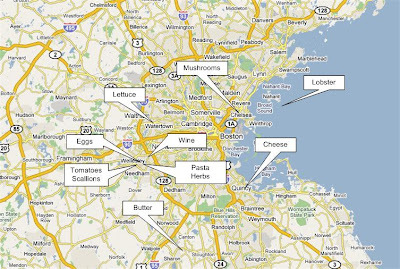 We found some butter from the Crescent Ridge dairy in Sharon, and some hot-house grown Boston lettuce too. By this time, we had worked up a locavoracious appetite. Clean the mushrooms and cut into 1/2” slices. Place in a bowl with some olive oil, balsamic vinegar and sliced scallions to marinate for several hours. Toss occasionally to mix, being careful not to break up the mushroom slices. Slice the Mozzerella into 3/8” slices. Place in a bowl with a little olive oil and white wine vinegar and some thinly sliced scallions. Marinate for several hours. Grill the Portobello slices for a minute or two on each side. 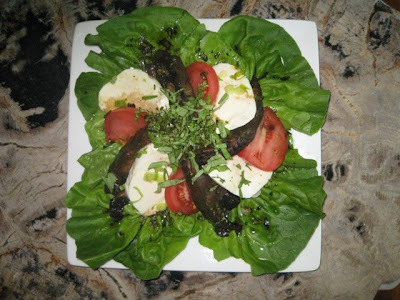 Slice the tomatoes and arrange the Portobello, mozzarella and tomato slices over a bed of lettuce. Add dressing (below) and top with the basil leaf chiffonade. Grind the seeds and salt. Blend the liquids and ground spices. 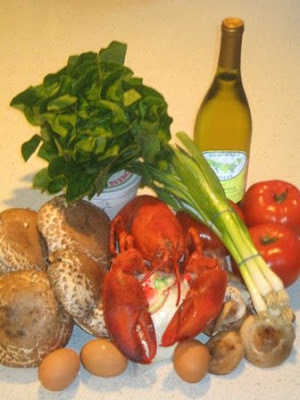 Our Lobster Quadrilles are giant square parsley-pasta ravioli stuffed with lobster claws and mushrooms. This recipe is enough to make 6 Quadrilles - enough for 3 people. Saute the garlic and mushrooms in the olive oil until they are soft.Mix all the ingredients in a bowl and set aside. Sort through the parsley and pick out a few dozen nicely shaped leaves. 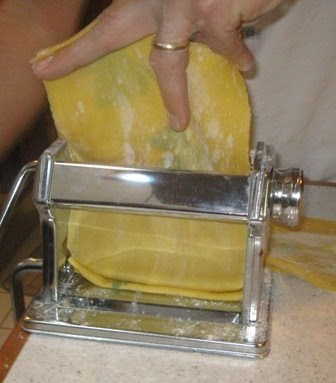 Using a pasta machine, roll the dough out to the second-thinnest setting (#6 on Atlas style machines). 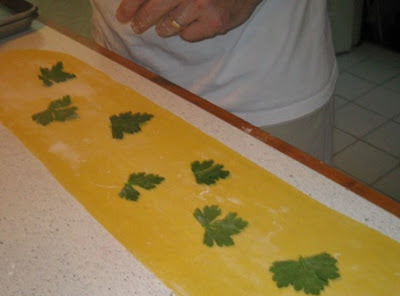 Lay out half the dough and arrange the parsley leaves on it. 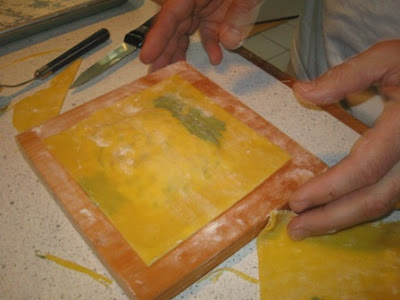 Cover with the other half and press firmly to seal. Then roll the dough once again to the second-thinnest setting. The parsley leaves will be visible through the dough. Assembly can be done on any flat floured surface, but a simple mold will make forming the lobster quadrilles easier. Mine is just a piece of pine board with a 3 1/2” x 3 1/2” x 1/4” chiseled recess. The dough should be in one or more strips approximately 5 1/2” wide. 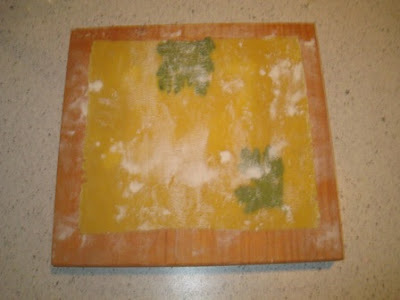 Cut the dough into 5 1/2” squares. 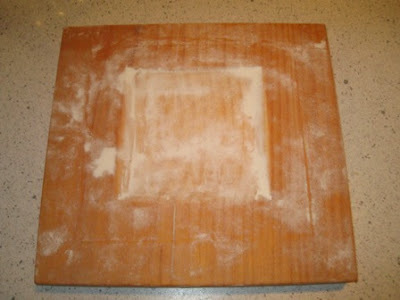 Lay one square of dough on a floured surface. Put a generous scoop of filling in the center and spread it to about 1” from the edges. The filling should be about 1/2” thick at the center. Brush the edge will a little of the beaten egg and place another square over it. Squeeze out any air and seal well around the edges. 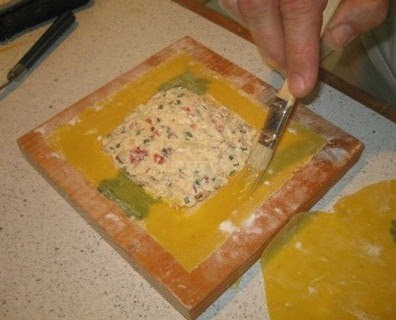 Ravioli this size can break apart easily, so handle with care. Gently lower them into boiling water, one at a time. Cook in small batches for 3-4 minutes, or until they float to the top. Carefully remove from the water with a strainer and drain. Saute the garlic in the oil until soft and translucent. Lower the heat and add the butter. Remove from heat when the butter is melted and stir in the parsley. 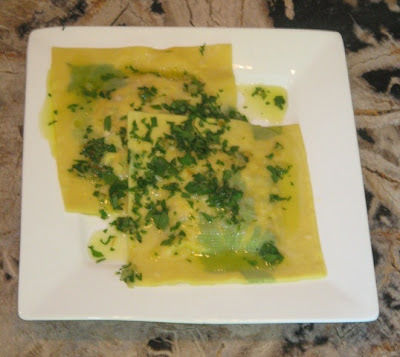 Are those ravioli, or throw pillows? Those are HUGE! And look really tasty! Excellent job! all i can say is wow and thanks for the recipe.